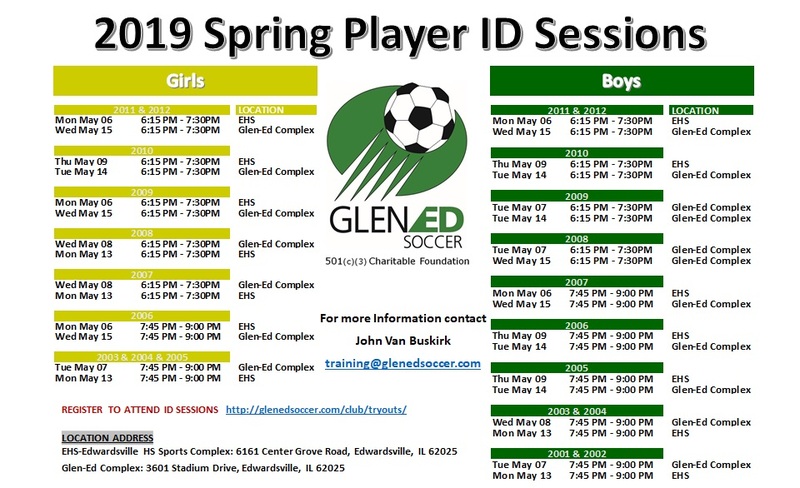 “If you are a returning player or new to Glen-Ed, the Player ID Sessions are tryouts used to evaluate player abilities and determine if the player will be selected to play for Glen-Ed Soccer. Online registration will close May 16th. Players must tryout in their birth year age group. The club suggests the player attend both ID sessions to offer the selection committee the most information to make a fair determination of a player’s abilities. Please arrive 15 minutes before your scheduled tryout time to check in. Please have the player bring a ball, wear shin guards and bring something to drink. The Glen-Ed Sports Association was created to assist players to ‘Pursue the Dream’ by offering quality select sports participation in soccer, basketball and lacrosse at an affordable price. The Glen-Ed Sports Association focuses on individual and team development through the improvement of skill, knowledge, teamwork and self-esteem. Along with generous donations from our partners and time commitment from volunteers, the club is able to maintain a low fee structure and increase the participation of boys and girls in select sports. The goal is to build leadership, character, integrity and a lifelong passion for sports through a fun, challenging and safe environment. The club is a Federally Tax Exempt 501(c)(3) Charitable Organization committed to helping players in the St. Louis and Metro East area. Our Tax identification # is 45-1771660. The Club has 3 divisions. U8-U11 Boys and Girls fall into the Youth Development Division. U12-U14 fall into the Junior Division and U15-U19 teams fall into the Senior Division. In Junior and Senior Divisions, there is a first team (United), a second team (Elite) and a third team (Select) in each age group when numbers allow. Whichever the case, players have made a decision to play competitive soccer and are placed based on their passion and ability.